Tonight, I had the pleasure of watching the 100th episode of a television series I’ve enjoyed over many years, Grand Designs. The host, Kevin McCloud, has a lovely manner and a way with words. Sometimes he doesn’t mince them either, as he scrutinizes potential ideas and plans for lavish homes/properties. Here’s a funny Guardian article about why people love Kevin (but do we really know him?) and an overview of the 100th episode. 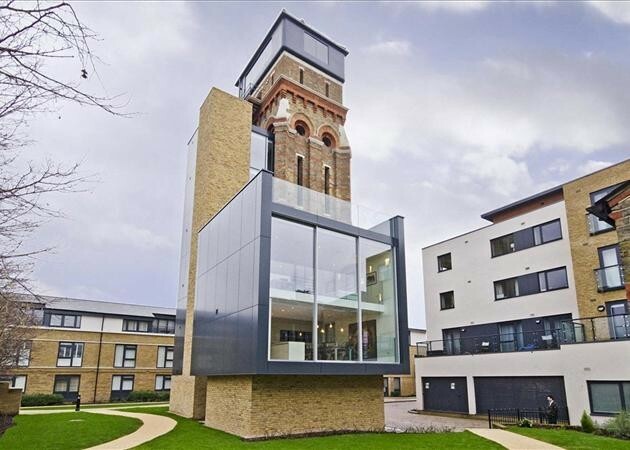 The Kennington water tower conversion, completed in eight months in 2012, was an incredible undertaking. About a year after this London property was finished, it went up for sale. (That link has quite a few photos or you can google ‘grand designs 100th episode’ and click on images.) Here is the blurb about the build from the architects. And here’s another extensive photo gallery from a magazine spread. Would you like to live in a vertical tower with incredible views? I think it would be fine for a year, with that amazing outlook making up for any inconveniences. The owners did say living there was sometimes a hassle – especially forgetting something below when you’re up top and having eight double flights of stairs to deal with. But wow, what a view! You’d be fitfor15in15 fit in no time. I wonder how much it eventually sold for? Liked the article on Kevin. I too have a bit of an on again off again feel about him. Love the reference to him maybe liking his guinea pigs more than people/houses. My suspicion is that he is probably a self absorbed egoist but maybe I am doing him a big disservice – my opinion came alot from the program when he built housing developments himself. Anyway nobody can argue with the success of the program or its spin offs. Yes, he’s a one-man television phenomenon, isn’t he? He can sometimes be a bit condescending but by the end of each show he always has something positive to say. Whether he really means it or not, we’ll never know!